It’s just a simple deep space exploration mission. An easy paycheck. Zip in, take a picture, zip out. 10 minutes, tops. Hold on, we’ve got a contact. Enemy starships at 2 o’ clock, coming in fast! Better head over and fire the port weapons. Better charge the shields while you’re there. Hold on, can someone charge up the reactor? Wait, there’s some sort of… space tornado on approach. Hit it with everything we’ve got! Now, hold on, what’s this? The ship’s computer is asleep? Didn’t anyone shake the mouse? Just a moment now, something’s on the ship. Somebody go activate the droids and take care of that. What’s that, we’ve run out of crew members? And now there’s an asteroid heading straight for us? And we’ve still got 4 minutes left before the ship finishes taking a picture of the sector? Well I suppose this isn’t too bad, but… wait, why did our shields just drain? What was that explosion? Did our main reactor just EXPLODE? 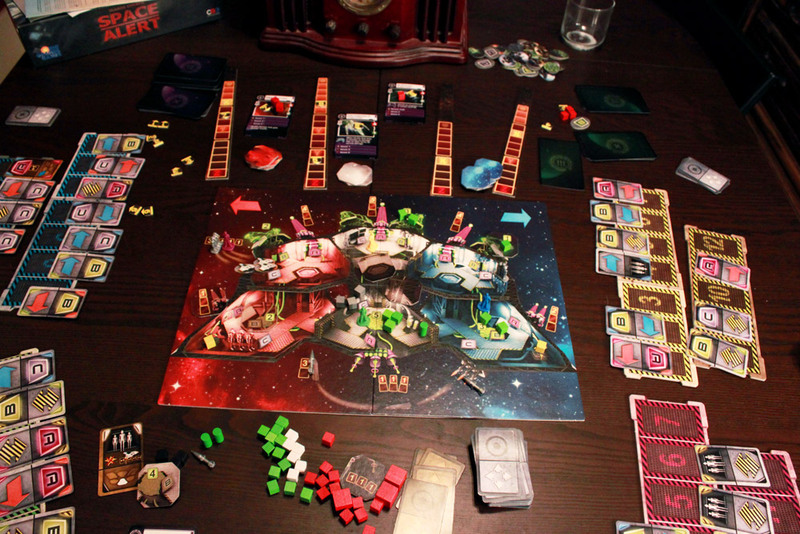 Ladies and gentlemen, welcome to Space Alert, the frantic, cooperative, and real-time board game about managing the chaos of perhaps the most unlucky space mission ever undertaken by mankind. 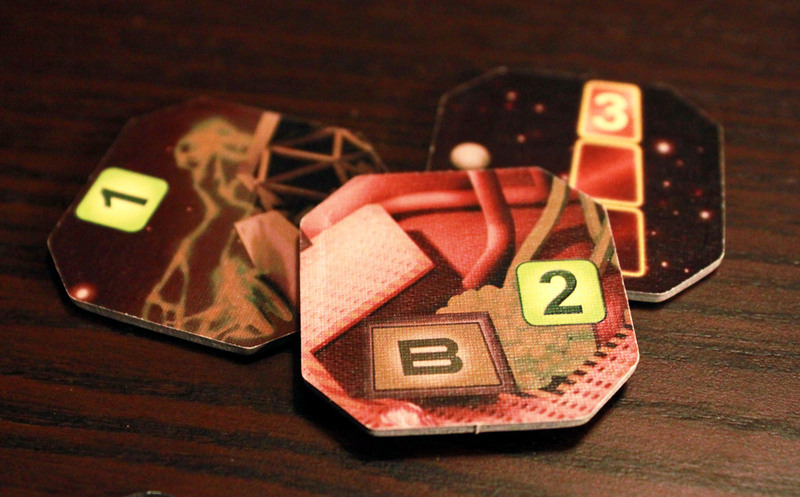 In Space Alert, players are tasked with one simple job: survive for 10 minutes. Unfortunately, these uncharted sectors are extremely dangerous, and the threats you encounter will make these orders far from simple (despite the claims of your commanding officers). During the course of the game, each player will take up to 12 actions. These actions are very basic: move left/right/up/down, press A/B/C buttons, and activate Androids. Here’s your ship. You may be missing engine parts, but we’re pretty sure you’ll be okay out there. It’s only 10 minutes, after all. The ship is divided into 6 sections: Red (left), White (center), Blue (right), with an upper and lower level for each color. In each section, the 3 buttons (A, B, C) do something. A buttons always fire weapons; B buttons charge reactors or shields depending on the sector; and C performs the special action, which ranges from activating Androids, to firing missiles, to shaking the mouse on the ship’s computer to prevent it from going to sleep, or even looking out the window to get visual confirmation of the sector. The Activate Androids action allows a player with Androids to attack internal threats. 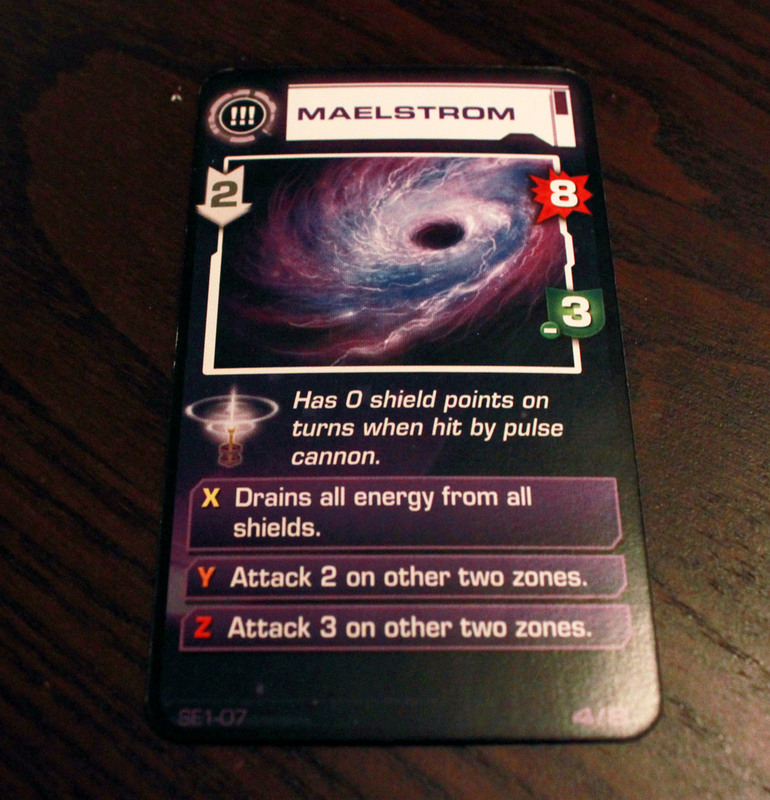 A CD plays along with each mission, announcing when threats appear (which are drawn randomly from threat decks), when players can draw new cards (or trade cards with each other), when communications are down (and thus players cannot speak), and when the mission ends. Players must communicate and plan their actions under the guidance of one player appointed Captain, in order to take on external and internal threats. They must coordinate their actions so that there is enough energy available to fire weapons and charge shields, and that enough damage is dealt to threats to actually make a difference. Actions are planned by placing cards on an ordered tableau for each player. An ALMOST fully planned mission. The top icon on each card is the one chosen to implement. Pressing “C” repeatedly is probably a bad sign you screwed up. Once the CD finishes, the Captain steps through each round, resolving actions, the appearance of new threats, and the activities of the active threats. Players win if they make it through all 12 rounds alive; players lose if any section of the ship (red, white, or blue) receives 6 damage points. Players can track their progress over time by keeping score; points are earned for destroying threats (as opposed to simply surviving them) as well as that “visual confirmation” action. 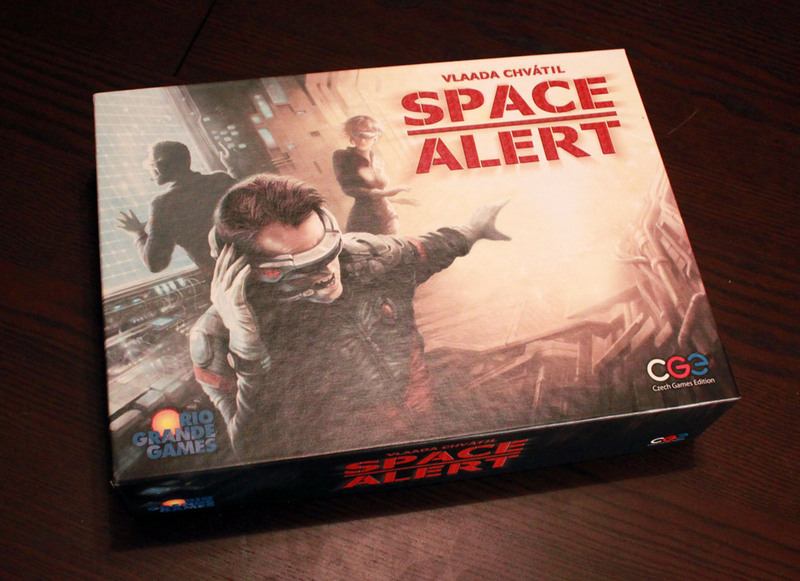 Space Alert is not a game that you achieve victory very often. However, it is a game that is quite enjoyable even when you lose, and often times more entertaining when you fail horribly than when you succeed. If you like such frantic sorts of fun and you enjoy the panicked sense of doom you get as you are running out of time and yet another threat just appeared and you just realized you’re a step off from everyone else, Space Alert does not disappoint. The game does an extremely good job of breaking down your options into very simple, almost binary choices. Since everything is relative to your position on the board, you can accomplish a lot with just a few types of cards; and, since each card is split into movement and button-mashing and you can use it for either one, you always have options and won’t get stuck in a corner. There’s also the occasional “data transfer” on the CD tracks so you can trade cards if you’re missing something. 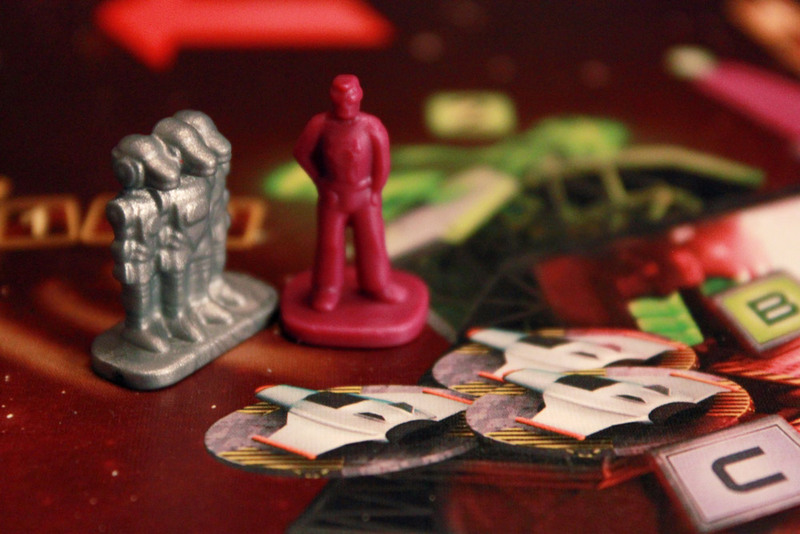 The game strongly encourages cooperation. In order to have any chance of success you have to communicate clearly to the other players what you are doing and try to get them to do what you need them to do at the right time, and vice versa. The “dominant player” problem that many complain about in regards to cooperative games is not a problem here, even if you have a dominant player. 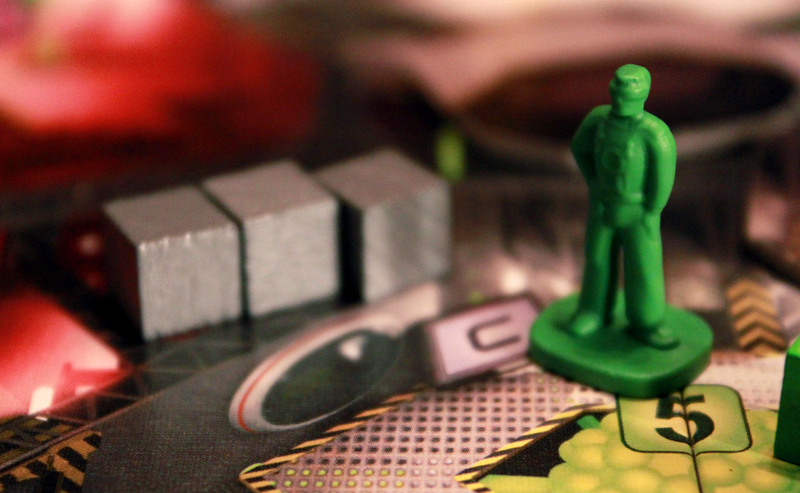 In fact, the game assigns a “dominant player” to be the Captain, and you’re going to need a decent captain to help everyone coordinate, keep track of what reactor has been charged and what weapon needs to be fired, and toss out “orders” to try and get things done – but the real-time nature of the game prevents the captain from having too much control, so that every player gets to play, and will contribute to the success and failure of the mission. It takes very little to cause failure. A single misalignment in actions will cause a cascade of increasingly unfortunate events as unpowered weapons are fired multiple times in a row, or a fully-charged reactor is recharged, wasting time and energy, or the wrong enemy is attacked resulting in the right enemy succeeding in a devastating attack on your ship. It’s so easy to make a mistake that no one can be blamed when it happens, and it is often to hilarious results as you imagine the scenario playing out in front of you as you step through the events once all the planning has happened. SOMEONE’s got to lug the androids around, or what good are they? There is a lot of variety to be had here. While the audio tracks on the CD are the same every time you play them, there are a decent number of tracks to mix it up a bit, and a bit of randomization in the enemies you actually face and the approach vectors that get chosen prevents the game from being predictable and solvable. If that is not enough, you can get additional tracks off the game’s website. That was MY biggest concern before I tried the game, and it was definitely solved to my satisfaction. My second biggest concern, which surfaced after the first time I played, was how the game functioned with a player count other than 4. The game requires at least 4 “players” in order to have a chance of success. 5 players are taken care of with “unconfirmed reports,” which are threats that you ignore if you don’t have 5 players, but if you have 2 or 3 you have to fill in the gaps. I’m not a huge fan of “dummy” players and so I was worried that this would be cumbersome, but after many games with just me and my wife, my concerns over this were assuaged as well. Planning works just as well when you’re planning for two units instead of just one, and rather than managing separate hands for the extra non-players, the rules provide you with a larger hand of cards to play from with some limitations. If there’s one negative, I would say it is the disconnect between the planning phase and actually resolving all the actions. It’s an extremely minor issue, but it feels a little slow to have to step through all these actions after the frantic insanity of the real-time portion of the game. There is still a lot of entertainment value as you watch everything unfold, usually horrifically, but you’re not actually playing at that point. Other than that, if you can’t handle the intense real-timeyness of the game, you don’t like losing 95% of the time and you don’t get the humor of it all, you probably won’t enjoy Space Alert. That’s not really the game’s fault though… it is what it is. It’s definitely not a “universal appeal” sort of game – too intense for some, to silly for others, too out-of-control for yet another group, but what it does, it does well. I suppose I should mention components – they’re great. The cardboard stock is nice, the cubes are brightly colorful and easily differentiated. Cards have nice symbols on them to read from a distance, although it is easy to forget about (and challenging to read from across the table, especially quickly) the special abilities. The plastic miniatures are not extremely detailed, but they have character. The game includes a “tutorial” CD with a series of missions to introduce game concepts one at a time, stepping up the complexity as you go along. This is ideal for a group of newbies, but these missions do not provide a challenge (even if you completely flop the mission and do everything wrong, you’ll probably technically survive) so when you have experienced players, you’ll likely want to jump right in to the game even if you have a newbie or 2 along with you. 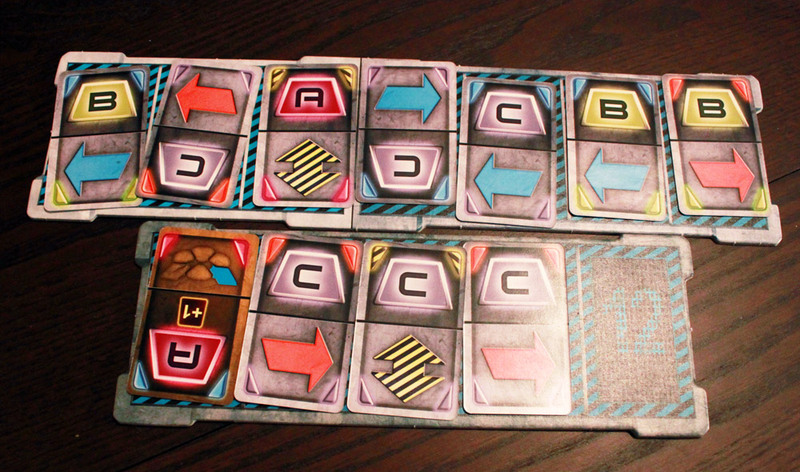 In conclusion, Space Alert is a great example of a fun, crazy, silly, real-time game. If you enjoy that sort of thing you’ll have a wild and fun time. If you don’t, the game is not going to make you fall in love with it. Well, maybe it will, you never know. It’s a lot of fun, thematically AND mechanically, and it’s one of the few games both I the thematic-game-loving gamer and FarmerLenny the euro-game-loving gamer both appreciate. Funny and enjoyable theme in space! I have to say that this is one of my all time favorite games! It is sooo much fun and my play group loves it. 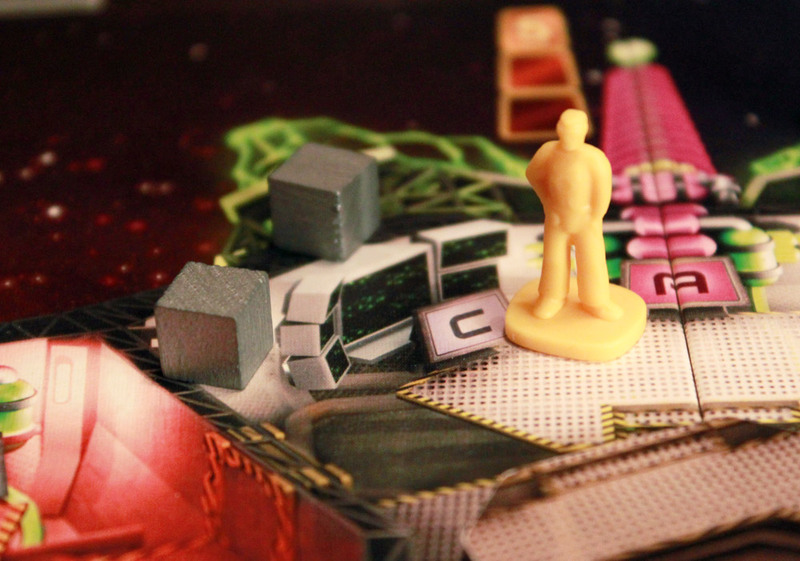 We actually play with the Star Trek re-theme print and play version, which is amazing. (You can find it on boardgamegeek.com.) I definitely agree that the core game is a 9.0. I think this bumps up to a 9.5 or a 10 with the addition of the expansion pack (The New Frontier). It adds a ton of fantastic new content and replay value: more threats, double action cards, specializations (roles that give players an extra card with a special ability), and a cool achievements and XP system. I heavily recommend taking a look at the expansion pack if you like the core game. Sounds like I’m going to have to try the expansion.